Glenn Boyette, a Johnston County farmer and founder of Clayton Fear Farm, is one hard-working man. Imagine his surprise when, while trying to get away for a bit of R & R earlier this year at the Outer Banks, he started having chest pains. After a stress test showed severe blockage in the arteries leading to his heart, he was scheduled for triple bypass surgery at the WakeMed Heart Center. After his successful surgery, he felt indebted to WakeMed&apos;s heart specialists. He wanted to find a way to appropriately express his appreciation to WakeMed&apos;s staff for the care he’d received since he felt he owned them his life. As he began to prepare for this year&apos;s Clayton Fear Farm, Boyette found a fitting, if a bit unusual, way to say thanks. 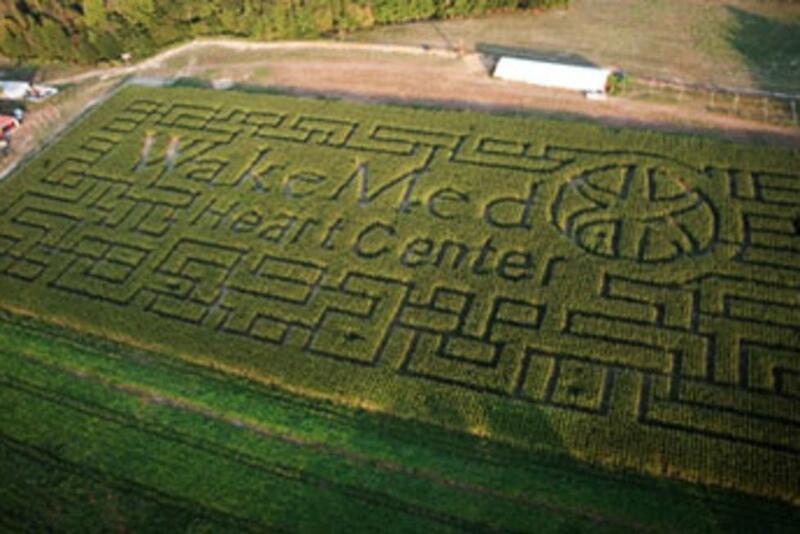 Carved out of a canvas of five acres of corn with intricate twisting mazes totaling nearly two miles, this year&apos;s Clayton Fear Farm corn maze features a familiar image - WakeMed’s logo. If any of this year&apos;s 35,000 or so Clayton Fear Farm visitors arrive by plane or hot-air balloon, they’ll see WakeMed’s logo etched into the countryside. Those arriving by car or some other more common ground-hugging mode of transportation to enjoy Boyette’s Halloween tradition on 60 acres in rural Johnston County may just feel the love. Clayton Fear Farm features three haunted houses, a 3-D adventure, a spinning vortex, haunted hayride trail, and pumpkin patch. Ticket prices are $12 for single attractions or $25 for all inclusive. The Clayton Fear Farm opens at 7 pm Oct 14-16, Oct 20-23, and Oct 26-31.